In real estate, “closing” is a good thing. In theatre, “closing” means a production is ending. Bruce Norris’ Pulitzer and Tony winning Clybourne Park closes its run this Sunday. A few seasons ago, the Arkansas Rep produced Lorraine Hansberry’s seminal work A Raisin in the Sun. Clybourne Park explores events which happened before and after Hansberry’s play. 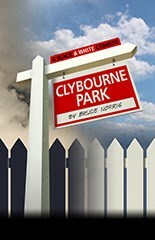 Clybourne Park is a bitingly funny and fiercely provocative play about the volatile combination of race and real estate. Written by Bruce Norris and directed by Rep founder Cliff Baker, its searing wit, intriguing plot twists and hard hitting social commentary make Clybourne Park a theatrical tour de force not to be missed. In 1959, a white couple sells their home to a black family (the fictional Younger family from A Raisin in the Sun), causing an uproar in their middle-class neighborhood. Fifty years later in 2009, the same house is changing hands again, but the stakes have changed. As neighbors wage a hilarious and pitched battle over territory and legacy, Clybourne Park reveals just how far our ideas about race and identity have evolved. The cast includes Shaleah Adkisson, Ryan Barry, Katie Cunningham, Lawrence Evans, LeeAnne Hutchison, Robert Ierardi, Jason O’Connell, and David Tennal. The creative team includes scenic designer Mike Nichols, costume designer Yslan Hicks, lighting designer Yael Lubetzky, sound designer Allan Branson and properties designer Lynda J. Kwallek. The play was first performed in 2010 at Playwright’s Horizons. Following that production Norris received the 2011 Pulitzer Prize for Drama. A subsequent production was mounted on Broadway in 2012. The Broadway production was nominated for four Tony Awards and won the Tony for Best Play. Clybourne Park is made possible in part by a grant from the Arkansas Black Hall of Fame Foundation, a component fund of the Arkansas Community Foundation. For a review of Clybourne Park, read this. This entry was posted in Theatre and tagged A Raisin in the Sun, All My Sons, Allan Branson, Arkansas Black Hall of Fame, Arkansas Repertory Theatre, Avenue Q, Bruce Norris, Cliff Fannin Baker, Clybourne Park, David Tennal, Fences, Frost/Nixon, Jason O’Connell, Katie Cunningham, Lawrence Evans, LeeAnne Hutchison, Lorraine Hansberry, Lynda J. Kwallek, Mike Nichols, Playwright's Horizons, Pulitzer Prize, Robert Hupp, Robert Ierardi, Ryan Barry, Shaleah Adkisson, Tony Awards, Yael Lubetzky, Yslan Hicks by Scott. Bookmark the permalink.